SSC Men: FIT Takes 12-5 Road Win Over Embry-Riddle – All Recaps! DAYTONA BEACH, Fla. – Florida Tech cruised to its second SSC win in a row Wednesday night as the Panthers shut out the Eagles in the first half and rode the momentum to a 12-5 result at the ERAU Lacrosse Field. Justin Williams paced eight Panther goal scorers with a hat trick. Reid Chaconasrecorded two goals and an assist while Brad Schillinger tallied two goals. Matt Gutmann and Logan Sweeney notched a goal and an assist apiece. Tyler Oblong, Brett Pohlmeyer and Patrick Stewart each added a goal in the win. Thomas Gribben led the defense with three ground balls and two caused turnovers. Daniel Flock finished with nine saves in goal. Ryan Land won 10-of-16 face-offs and picked up three ground balls. Williams opened the scoring with an unassisted goal less than three minutes into the game. Sweeney made it 2-0 with his lone goal of the game with 3:24 to go in the first quarter. Oblong then pushed the lead to 3-0 off an assist from Chaconas with just over two minutes left in the first. Goals by Schillinger, Chaconas, and Gutmann increased Tech’s advantage to 6-0 in the second quarter. Williams then found Stewart for a score with 1:53 left in the frame to hand the Panthers a 7-0 edge at halftime. Coleman Jacobs got the Eagles on the board at the 11-minute mark of the third quarter to make it 7-1. Williams answered with his second goal of the night, off an assist from Sweeney, to push the lead to 8-1 with 3:55 left in the third. Three consecutive goals by ERAU cut the Panthers’ advantage to 8-4 heading into the final quarter. It did not long for Tech to respond to the Eagles’ run as Chaconas and Schillinger each found the back of the net within the first two minutes of the fourth quarter, increasing the margin to 10-4. Mitchell Cody scored for the Eagles to make it 10-5 with 7:31 to go. However, goals by Pohlmeyer and Williams over the waning moments sealed the deal for the Panthers as they collected their third SSC win of the season. Florida Tech finished the game with more shots (43-32) and face-off wins (11-9), as well as a higher success rate on clears (23-of-26). The Eagles were 21-of-28 on clears and ended with 23 turnovers in the game. With this win under their belt, the Crimson & Gray will now try to regroup, get players healthy and refocus for the remaining regular season schedule. Next up, the Panthers continue conference action this Saturday, Apr. 13, as Tech travels to Saint Leo, Florida to take on the 2018 National Runner-up Lions. 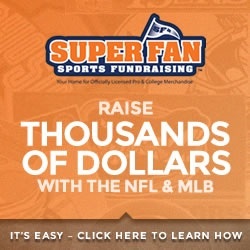 Start time for the contest is set for 3 p.m.
SportsLowdown.com Recap by Donny Rieber Jr. 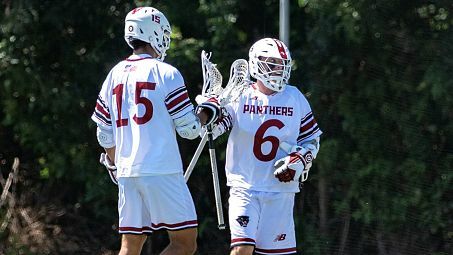 The Florida Tech Panthers started with a seven-goal run on Wednesday, en route a to a 12-5 win over Embry-Riddle in a Sunshine State Conference victory in Daytona Beach. Justin Williams scored a hat-trick for the Panthers while adding an assist. Brad Schillinger had two goals, as did Reid Chaconas. Five Panthers had one goal each. DAYTONA BEACH, Fla. – The Embry-Riddle men’s lacrosse team fell behind 7-0 in the opening half and couldn’t recover as the visiting Florida Tech Panthers downed the Eagles 12-5 on Wednesday night at the ERAU Lacrosse Field. The loss moves Embry-Riddle’s record to 8-7 and 0-5 in SSC play, while FIT improves to 7-3 and 3-2 in conference. Five different Eagles netted goals, including Kyle Dalrymple, Mark Urso, Michael Forte, Coleman Jacobs, and Mitchell Cody. Jared Kane and Ian Heggblod earned assists while Forte and Lucas Fraser led the team with six ground balls each. Fraser also made 14 saves in goal for the Blue and Gold. Florida Tech scored three goals in the first and four more in the second while keeping the Eagles off the scoreboard to take a 7-0 lead into halftime. ERAU’s offense awoke in the third, with Jacobs opening the scoring in the frame and Dalrymple, Forte, and Urso all scoring goals in the final 88 seconds of the period, trimming the deficit to 8-4 after three quarters. FIT scored the first two goals in the fourth to take a 10-4 lead before Cody scored a goal with 7:31 left in the game. The Panthers added a pair of late goals to take the win, 12-5. Embry-Riddle will play its final road game of the regular season on Saturday at Florida Southern. Game time is set for 1 p.m. in Lakeland. PrevSSC Men: #16 Tampa Holds Off 2nd Half Rally by #20 Rollins to Win 13-12 – Both School Recaps!